When you are working on some project or deliverable, needless to say it has to be completed within a deadline and when there are several direct reportees or people reporting into you, it becomes an uphill task to sit and compute and calculate the time each one has required or taken to complete the part of the said task allotted to them. In comes a sample blank timesheet template which can just help in this regard and make life much, much easier for you, or whoever you have delegated this part of the job to. The whole idea behind a blank timesheet is to assist you not only in calculating time undertaken to complete a job, but also compute salaries and the cost of a particular project. You may also like Biweekly Timesheet Templates. 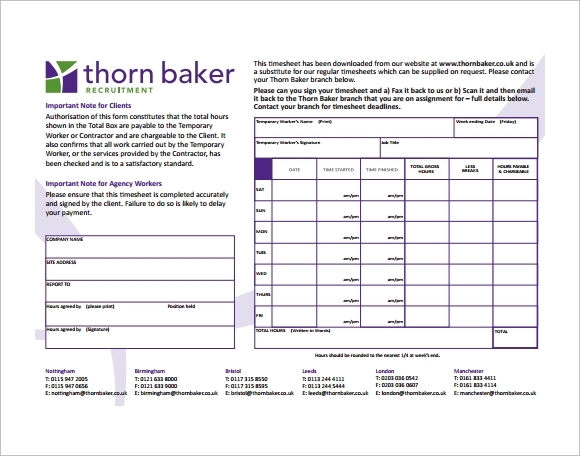 As the name suggests, the construction sample blank timesheet template is extensively used in the construction industry. Like most other blank timesheets, this one too can be easily downloaded from the internet and can be customized to suit the requirement of your department or company. 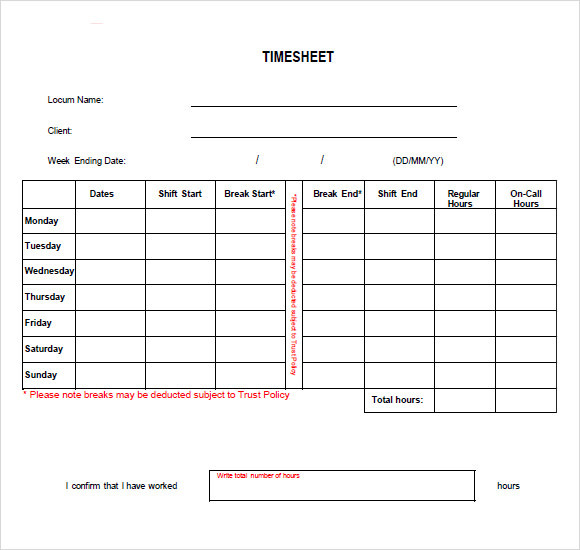 This type of timesheet template is available either in MS Word, MS Excel or PDF format, thus, making it easier to be downloaded and used. 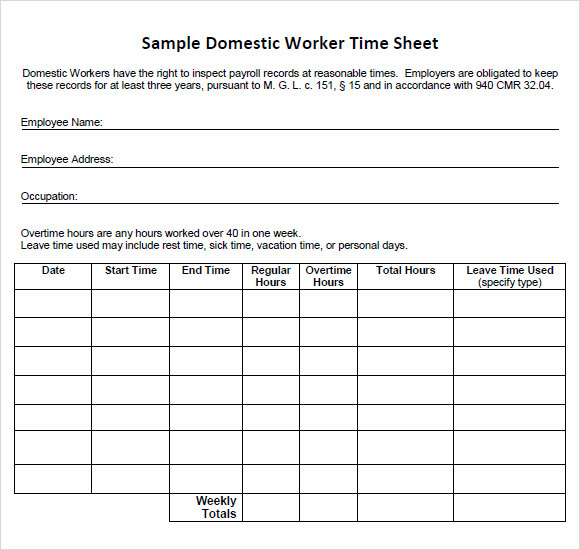 An employee timesheet form is a type of blank timesheet that can be used to compute the hours the person has worked. 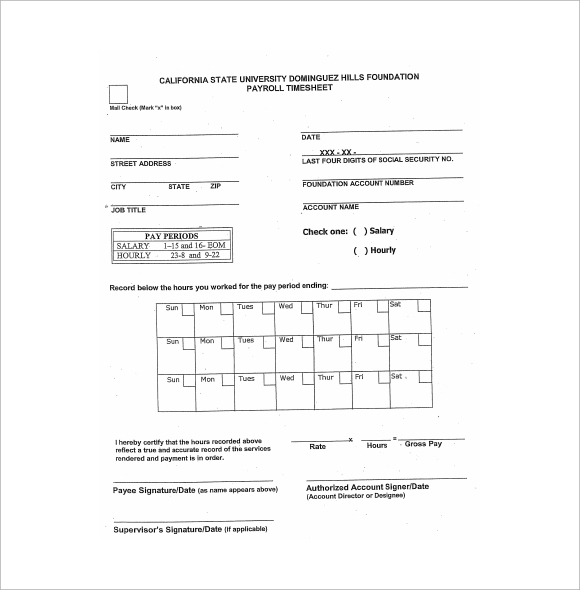 This template is available on the internet and is a form which is designed to contain information, such as the name of the employee, the social security number, the division and the department he/she belongs to, the location he/she works out of and the dates for which he/she has worked. When it comes to calculating the actual hours worked by the employee, the information can be collated in the form of a table that can contain the month and the day of the work and the ‘from and to’ hours that the employee worked. 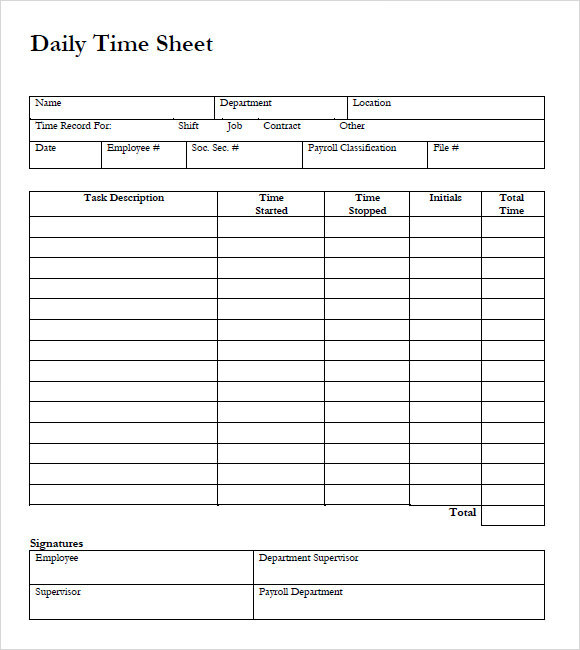 This type of sample blank timesheet template, as the name suggests, is used mostly by the HR department of an organization. 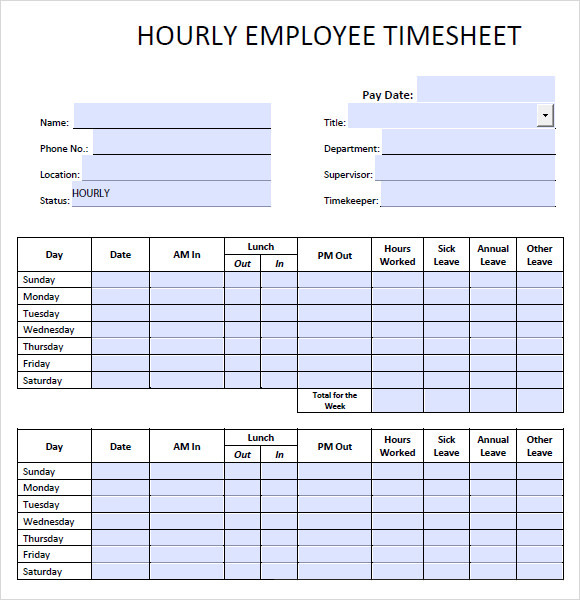 This timesheet template is helpful in making calculations with regard to the payroll of a particular employee or employees. 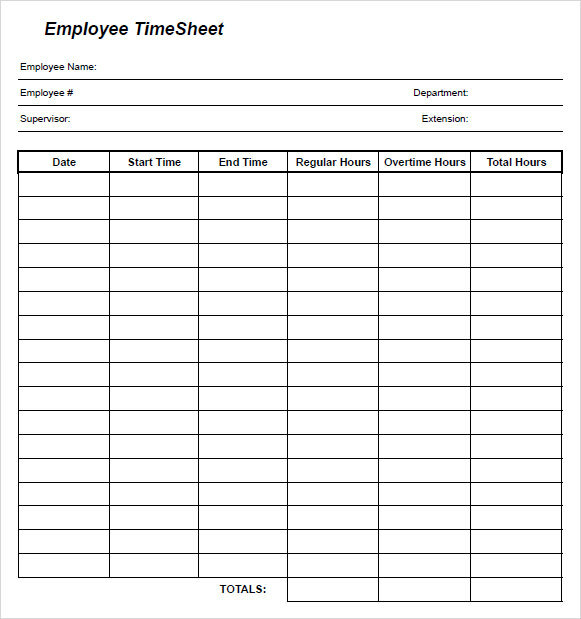 Like most other timesheet templates that are available online, this one too can be easily downloaded and personalized to be used by the HR department. There are multiple benefits of using a blank timesheet template. Irrespective of the department that it is being used for and by, a blank timesheet template can help in streamlining several employee functions such as calculating salaries, keeping track of working hours, and shifts and so on. These templates, therefore, help in bringing a semblance to the way an entire organization or even department functions and operate. How to Create a Blank Timesheet Template? 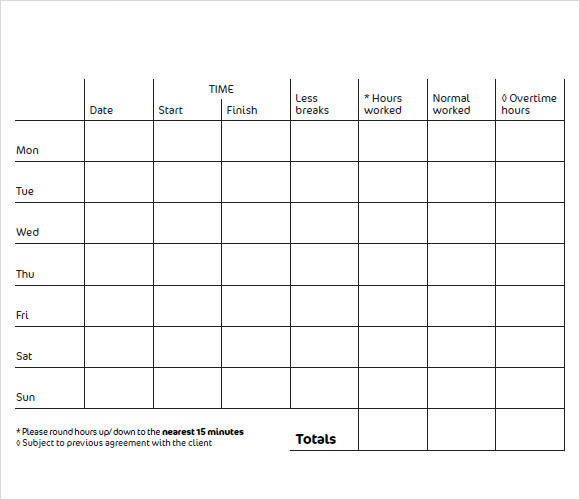 A blank timesheet template can easily be created from any one of the templates that is already available online. In case, a particular department or professional is not satisfied with the types of templates that are available online, he/she can easily create a new one incorporating the points/heads found in other templates. Such a template can be created in MS Excel, MS Word or even PDF format, as per the need of the organization. You may also like Rate Sheet Templates. 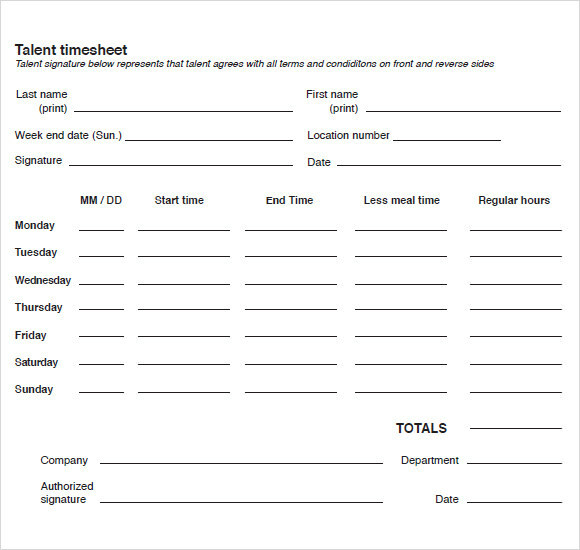 When do You Need a Blank Timesheet Template? If you are in charge of tracking, collating and/or calculating critical employee or organizational data, sample blank timesheet templates are your best friends. You can use these timesheets to make daily, weekly, fortnightly, monthly, and quarterly, half yearly and annual calculations. You can use these timesheets to calculate overtime billable hours too. 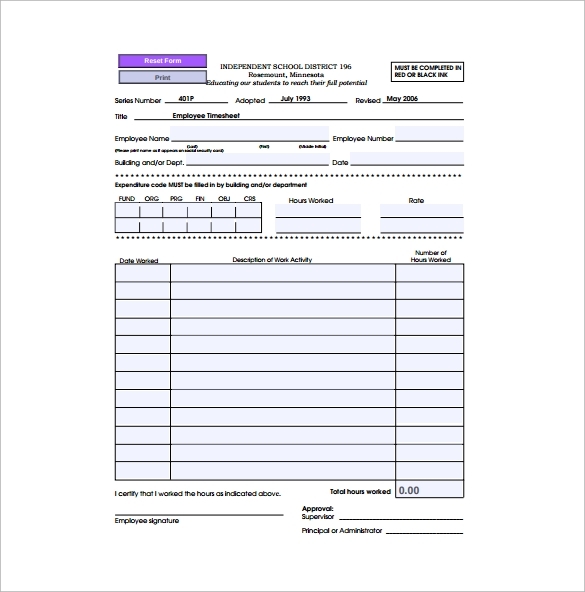 Along with helping you to create and collate employee information and data, these blank timesheet templates also help you and the organization that you are part of to contain information and create a repository of historical data that can come in handy any time.